IN NOVEMBER 1934, England met World Champions Italy in London in a game that has forever been known as “The Battle of Highbury”. This tag was no accident, however, for whatever was going to happen on that gloomy afternoon in North London, a football match was always going to become a theatre of war. Europe in the 1930s was an uneasy place. The Great Depression had ended the continent-wide dance on the volcano that the 1920s became and political unrest was rife. Fascism was taking hold of Germany and Italy and of course, Spain was about to implode. While the decade was an exciting period in many ways, it was also a blood-thirsty time characterized by a huge divide in political persuasions. As ever, Britain felt, in some ways insulated from the events taking place in continental Europe, although the memories of the First World War were still very fresh. The Fascists, with the exception of Oswald Mosley’s Blackshirts, belonged across the channel. In the summer of 1934, Mosley’s British Union was involved in a mass brawl at a rally at London’s Olympia. It was a seismic event that worried people and all but killed off mass support for Mosley’s party. Around the same time, the so-called Night of the Long Knives took place in Germany, which was essentially, the mass murder of Adolf Hitler’s opponents. People were starting to become very nervous. Sport was seen as a valuable propaganda tool for people like Benito Mussolini and Adolf Hitler. The 1936 Berlin Olympics provided the latter with his platform to demonstrate Ayran strength and fitness, while Mussolini was able to use Italy’s football team as the emdodiment of the fascist state and its superiority. as quick to point out that the final, against Czechoslavakia, had ended with “hand-to-hand fighting” on and off the pitch. In retrospect, it was a hollow triumph, given that Italy had used every trick in the book to ensure they were victorious. For example, Mussolini had dined with the referee before the day of the final. Not satisfied with winning the somewhat modest, but visually of its time, Jules Rimet trophy, Mussolini awarded Italy the “Coppa Del Duce”, an enormous bauble studded with jewels. The 1934 World Cup was characterized by an undercurrent of combat running through the tournament. Italian manager, Vittorio Pozzo used the sort of language that Il Duce would have been proud of, speaking of “soldiers”, “battlefields” and “war”. Pozzo, described as “short, tubby, with black glasses and a shock of bizarre black hair”, was very much Mussolini’s man. He also took the totalitarian approach to football management. England didn’t enter the 1934 World Cup. They had left FIFA in 1928 and there was an in-built arrogance that they didn’t need to test their strength in football – as far as England were concerned they were the undisputed global leaders of the game they gave to the world. Italy had met England a year before the World Cup. Herbert Chapman, the legendary Arsenal manager, led the party to Rome. The game ended in a 1-1 draw. As was customary in those days, a return match was to follow. England invited Italy to London and gave them a date at the most inhospitable stage of the season – a foggy, damp November afternoon. Sadly, Chapman would play no part as he had died in January 1934 after a short illness. The death of “the Emperor” cast a shadow over the remainder of 1933-34 and the start of 1934-35. This game has become known as “The Battle of Highbury” because of the bruising nature of the contest, but the truth of the matter is that this game was being labeled just that even before a ball was kicked. The Italian press sent their boys over to England with headlines proclaiming a football war. “The real World Cup final”, a little unfair on the Czechs, was how they saw the meeting at Arsenal stadium. 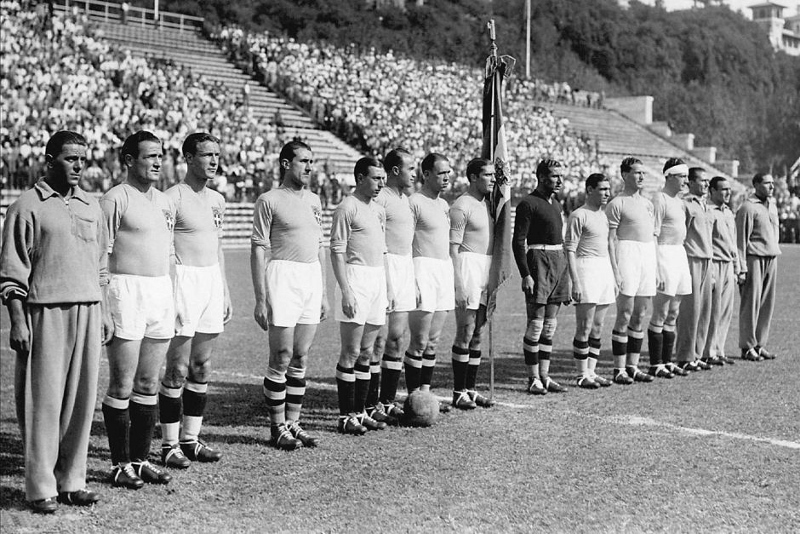 British Ambassador at the time, Percy Lorraine, recalled that the Italians “regarded the event as a test in which the prowess of the new Italy would be matched against the skills of the country where football has its home.” Italy’s players were lectured about the need for a victory and urged to show good behaviour. They even brought to the game 400 Maltese people in order to improve Italy’s political position in Malta. The game captured the imagination of the English public, for 300,000 applications were made for 60,000 tickets. Strangely, the gate was much lower than capacity. On the day of the game, business in Rome came to a standstill. Mussolini was said to have been in a “high state of excitement” and offered incentives for an Italy victory – cars, cash and a possible exemption from military service. Perhaps it was a ploy to drum up support for the game on a grim afternoon, but five Arsenal players were included in the original line-up for England: goalkeeper Frank Moss, hardmen Eddie Hapgood and Wilf Copping, Ray Bowden and boy wonder Cliff Bastin. Two further Gunners were added along the way in the form of George Male and Ted Drake, making it seven, a record that has never been beaten. If Arsenal formed the backbone of the England side, Juventus (five) and Ambrosiano-Inter (three) provided the core of the Italian team. Nine of the World Cup winning team would line-up at Highbury. The star of the Italian team was Guiseppe Meazza, a charismatic individual with matinee idol looks (he would not look out of place in Mario Puzo’s Godfather) and the attitude to match. He lived the lifestyle of the “rock and roll footballer” before the musical genre was even invented – a prolific womaniser, a gambler and not averse to dancing the Tango with a white gardenia clamped between his teeth or tucked behind his ear. 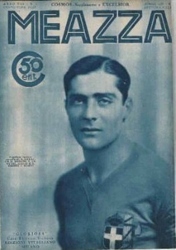 Meazza, on the pitch, had technical ability that compared to the great Pele and in 1934, “Il Balilla”, as he was known, was at the peak of his powers. Meazza’s dark, slightly sinister looks stared out from the English newspapers. To many people, England were playing not just another country, but “fascists”, another breed, “johnny foreigner” – and, ultimately, an altogether more menacing race. And to add fuel to the fire, England wanted to prove they were really the “World Champions” and not the officially crowned Italians. England’s team was relatively inexperienced, Male and Drake were both winning their first caps, Britton, Barker, Matthews and Bowden were appearing for only the second time. Just Brook (his 10th) and Copping (27) were into double figures. Matthews was 19 years old, Bastin 22 and Britton and Barker were the eldest at 27. The average age was under 25 – very young for an international side. Italy’s team, however, was packed with experience. Five were 30 or above and the average age was 27. Drake’s inclusion was no surprise, for he had made a dramatic start to his Arsenal career. He joined the Highbury brigade in March 1934, although the late Herbert Chapman had courted him for some time. Chapman had seen Drake as part of a new refreshed Gunners’ side he was aiming to build. At Christmas 1933, just before he died, Chapman told his backroom staff that the Arsenal team that had won two successive titles was “played out” and that new faces were needed to revitalise club. The man who made the modern Arsenal, and arguably modern football, was a little premature in his prediction, for his club won the 1934-35 championship before their grip on English football was finally loosened later in the decade. Drake’s England career was badly punctuated by injury and he won just five caps. In 1934-35, he played just twice for his country. But 26 other players appeared in the five England games. This was a time of great transition for the national team as evidenced by the fact that the eleven that ran out against Italy on November 14, 1934, never lined-up together again. “The most important football match ever played,” was how Pathe News described this game. It was certainly one of the most brutal, and the fun started early on when the muscular Eric Brook of Manchester City missed a penalty in the opening seconds. A minute later, Drake clashed with veteran half-back Luis Monti, who was one of three repatriated Argentinians in the Italy side. Monti had to go off injured, sustaining a dislocated knee cap. Pozzo and his aides felt that Drake had deliberately put Monti out of action, but later it was revealed that he had twisted awkwardly and broke a bone in his foot. Whatever the reason, this incident sparked off the fractious Italians. By the 12th minute, England were 3-0 ahead – two goals from Brook and one from Drake. It was, apparently, superb stuff to watch. 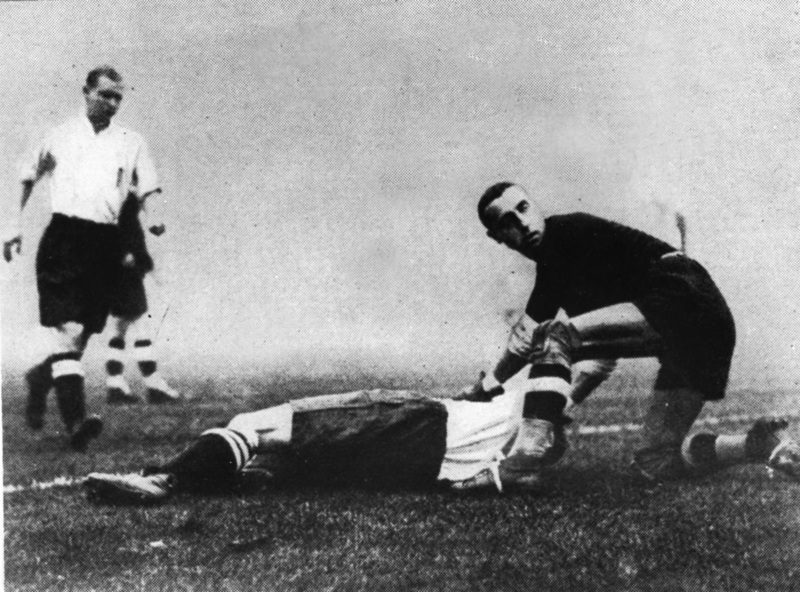 The Italians reacted aggressively and in the first 45 minutes, Hapgood’s nose was broken, Brook broke his arm and Drake had two black eyes and a leg that had been “cut to ribbons”. English supporters had never seen anything like it and made their feelings known. Some commentators felt that Italy’s reaction to what looked like a sound beating was to retaliate with sheer violence, and put it down to the country’s relative inexperience of the game – an argument that has little to support it. They were certainly used to getting their own way, as their record showed. They had lost four games in as many years and of course, they had won the World Cup and they would not have wanted to incur the wrath of Mussolini. They were representatives of the Fascist State – just before kick-off, an Italian ran across the Highbury turf with a huge flag that was adorned with the symbol of this ideology. They may just have been on edge! England’s approach was far different and still clung on to the “after you, Claude” Corinthian ideals. England limped out in the second half and had to cope with an Italian comeback. Meazza scored two goals in quick succession, in the 58th and 62nd minutes and then struck the crossbar. England were hanging on, but Frank Moss had an outstanding second half, pulling off several dramatic saves. Meazza also had a late effort that was deflected over the bar when it looked to heading for the back of the net. Italy’s performance after the interval won them many plaudits, largely because they had “stopped most of their tricks as the second half progressed – but the damage had been done”. The press reacted to the game with typical British outrage at the tactics of the Italians, although the World Champions were also praised for their comeback. “Italy’s great soccer fight with 10 men”….”England stars fail to shine”….”Our team goes to pieces after Meazza’s two goals….”A brilliant start but England are not able to keep it up.” A shade unfair on England, perhaps? The newspapers the following day were full of criticism about the Italian approach to the game. Some reporters even called for the Football Association to cease all games against the evil continentals. One journalist made a note of the foul count at the game: 61 fouls…37 mild…24 bad…42 dangerous kicks. He added that nine penalties should have been awarded. The referee, Otto Rudolf Olsen also went public: “I had to pull the Italians up and I gave them an awful warning. I said to them: ‘You must stop this rough, dirty play’.” Nobody seemed to be listening. But England were no angels and when the Italian team left London Victoria to return home, Monti was carried in a bath chair. Pozzo claimed that four players had been put out of action and Monti was sidelined for at least two months. Pozzo pointed to the stricken defender as the team left Victoria and told reporters: “This is the cause of our defeat.” The team boarded the train, a few Italians waved them off, Fascist salutes being the order of the day. Whatever happened to these likely lads? Arsenal goalkeeper Frank Moss never played again for England and his career in the years that followed the “Battle of Highbury” was plagued with injury. He retired at the age of 27 in 1937. Fellow Arsenal man Eddie Hapgood’s first game as England captain was against Italy and he also played in the infamous game in Berlin in 1936 when England’s players were forced to give the Nazi salute. His England career ended in 1939 just a few months before war broke out. Wilf Copping’s England career ended in the same game as Arsenal team-mate Hapgood’s (in Belgrade against Yugoslavia). Despite being tagged a hard man, Copping never got booked or sent off in his long career. George Male, who made his England debut against Italy, went on to win 19 caps and six Football League Championship medals with Arsenal. He was the last of the Chapman-era players to retire, in 1948. Ray Bowden’s Arsenal career was hampered by injury and he left for Newcastle United in 1937, retiring two years later. Arsenal forward Cliff Bastin was used as a propaganda ploy by Italy during WW2. Rome Radio claimed he had been captured in the Battle of Crete and was a prisoner of war. Bastin was virtually deaf, however, and had already been excused military service. Ted Drake’s career with Arsenal saw him score 139 goals in 184 games. He went on to be a successful manager with Chelsea, leading them to their first championship in 1955. Stanley Matthews, then of Stoke City, became a legend of the game, playing until he was 50 and racking-up almost 700 appearances and more than 50 for England. “The Wizard of the Dribble,” was his nickname. Eric Brook was just the sort of muscular individual needed in a game against Italy. He became Manchester City’s record goalscorer and had “one of the fiercest shots in pre-war football”. Derby County’s Jack Barker was one of the more experienced players in the England side of 1934, although his cap against Italy was only his second. He went on to captain his country once. Cliff Britton of Everton was described as one of the classiest players of his time and invented the “precision cross”. He later managed Burnley and Everton. Goalkeeper Carlo Ceresoli was making only his second appearance for Italy at Highbury. He won eight caps in total and was a member of the 1938 World Cup winning squad. Eraldo Monzeglio was also in that tournament, but didn’t play in the final against Hungary. Luigi Allemandi, a player who was once banned for life over a bribery scandal, went on to play 24 times for Italy. Attilio Ferraris died at a young age, 43, collapsing in a veterans game. Luis Monti, who played in two World Cup finals for two different nations- Argentina was the other – made only two further appearances for Italy after Highbury. Luigi Bertolini, who was instantly identifiable by his white bandana, worn to protect scar tissue, played until 1935 for his country. 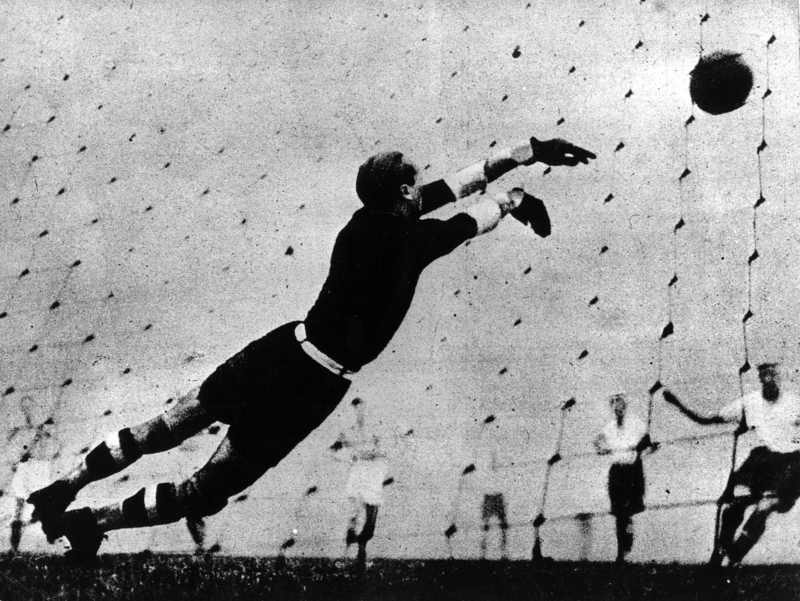 Enrique Guaita, born in Argentina, went back to his homeland a played internationally for them once more – he had been capped in 1933 for Argentina before moving to Italy. Pietro Serantoni, a Venetian, played in Italy’s 1938 World Cup win. Guiseppe Meazza captained the 1938 team and became a legend in Italian football. After his death, Milan/Internazionale’s San Siro was renamed the Guiseppe Meazza stadium. Raimundo Orsi, another Argentinian, returned to Latin America where he played for Brazilian and Argentinian sides. England, after beating Italy, could claim to be, at the very least, Unofficial World Football Champions (if you use Paul Brown’s fascinating exercise as a benchmark). Although victory allowed England to indulge themselves in the insularity that had characterised their game in the inter-war years – and indeed up to 1950 when they were given a rude awakening by the USA – some people were alerted to the creeping spectre of ultra professionalism. It would take England some years to realise. In 1938, as genuine war clouds gathered, black-shirted Italy regained the Jules Rimet Trophy. England did not enter the competition until 1950, when the need for world unity was greater than ever. Nevertheless, beating the World Champions was no mean feat. It’s not something England have done that often – the other occasions being 1948 4-0 v Italy; 1954 3-1 v West Germany; 1975 2-0 v West Germany; 1980 3-1 v Argentina; and 2011 1-0 v Spain. Previous Entry GOTP Notepad: Kashima on the brink of glory?